Dear Pet Supplies Plus, About 10 months ago I became a loyal customer with my new puppy Mueller. I was as inexperienced as they come and with a new labrador retriever with some really bad habits I needed more than just dog food from the pet store. I needed (and still do) TONS OF ADVICE. 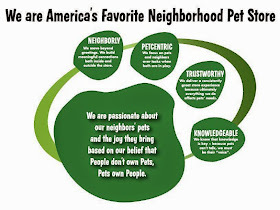 I am taking the time today to let you know about the staff at the Hollywood Pet Supplies Plus. I walk in just about every other week for food, treats, toys, and supplements for my (now two) labs. Allan and the customer service team welcome my family every week with open arms, ask to make suggestions, answer our 100 questions. No matter how bananas our requests were the previous week, they greet us as if we were old friends. Allan and the rest of team, have been there when we took in our newest rescue and every time our pups have been sick. While other people forget to make it to the pet store, we look forward to it. We would like to extend a huge thank you to the entire team for being there and being the best customer service staff ever! - Catherine, Jonathan and the entire furry family. Way to be knowledgeable Hollywood!